12-volt cigarette-lighter style plug. One installed in the kitchen and one in the sleeping area. Powered by the deep-cycle battery. Includes 30-amp outlet on passenger side, wiring, GFI outlets, 120 outlets, breaker box. Our 5000-BTU AC has climate-control and a quiet "sleep" mode. A deep-cycle battery can be charged over and over again. Many buyers get the optional solar panel so the battery is constantly charging. Bathroom has a medicine chest with mirror. Alarm sounds for smoke, high levels of carbon monoxide, and low levels of carbon monoxide detected over a period of time. Aluminum diamond plate trim adds to the "wow" factor. Entry door, located on the passenger side at the rear of the trailer, has keyed lock in handle, and a keyed deadbolt. It measures 6' x 21.5". Curved, diamond plate aluminum fenders match the diamond plate edge trim. The jack with wheel for easy maneuvering, acts as a stabilizer while the camper is parked and folds out of the way for towing. The kitchen has solid wood, high-quality cabinets, solid surface countertop, sink, and refrigerator. License plate holder is installed on the rear on the driver's side. 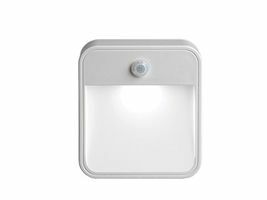 LED light at entry door turns on when motion is detected. Sealed unit, LED lights for brake, turn, and running lights. There are two mattresses of high-density foam for each bed. Each mattress measures 28" x 75" x 5". Freshwater-flush portable toilet with 4-gallon fresh water tank size, 5.5-gallon waste tank. 14" x 14" roof vent with hand crank. The sink includes drain, pressure-pump faucet, and on-board 5-gallon water supply tank. A stabilizer jack is welded to each corner at the front and rear of the trailer. The bottom bed lifts to give you access to lots of storage room. Wall to wall vinyl makes for easy clean-up. We use 15” silver-color, round-slotted steel wheels with 6-ply tires. 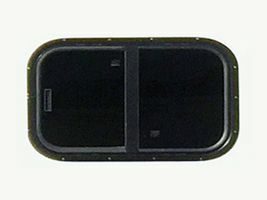 Sliding, tinted windows with screens measure 22" x 15". Located on the passenger side wall. Chrome finish outer trim ring with hub and lug cover give you the look of a custom wheel. Additional deep-cycle batteries provide more storage capacity when wired in series. Watch your favorite TV programs with our cable connection. For use at campgrounds or with your own satellite dish. 30-amp cord for use with shore power receptacle. Lock ring secures attachment. 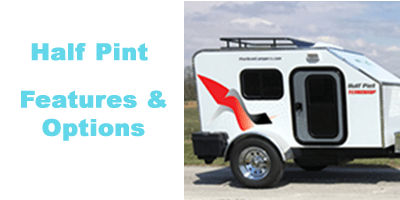 Electric brake requirements vary by state, but are generally required if a camper weighs 3,000 lbs. or more. The Big Brother is not even close to that weight. Upgrade to Jeep-style diamond plate fenders. Custom-designed graphic on both sides. Available in many colors. See graphic choices. The hitch receiver (welded to rear frame) holds bicycle racks and cargo carriers. Additional exterior lights installed at your choice of location. A 3-speed roof fan runs on 12-volt power from the deep-cycle battery. Aluminum rails allow for the attachment of various name brand cross rails. 48" long. This solar panel is a 20W panel that is sufficient for trickle charging the deep-cycle battery. The spare tire mount is installed on the side rail of the tongue on the passenger side. 15" 6-ply tire on standard silver-painted wheel. Spare tire mount sold separately. 15"H x 60"W aluminum diamond plate installed on the nose protects against stones. Locking, diamond plate box bolted to side steel plate comes with removable deep storage tray with hydraulic lift. It measures 8" W x 18" L x 18" H.
48" L x 12" W x 10" H.
Black, locking trapezoidal box is bolted to the tongue and measures 36" wide in the rear, 19" deep, and 18" tall. This locking, diamond plate, trapezoidal box is bolted to the tongue and measures 36" wide in the rear, 19" deep, and 18" tall. The 22" flat screen TV has a built-in DVD player and remote. The full-motion wall mount has a tilt and swivel articulating arm. Sliding, tinted window with screen and interior trim. The window measures 22" x 15". Available in rear wall only. © Copyright 2015-2018, PeeWee Campers and Trailers - All Rights Reserved.